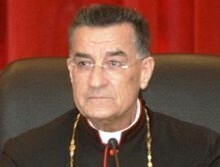 According to March 14 source, Maronite Patriarch Bechara Boutros al-Rai is very disappointed with Change and Reform bloc leader MP Michel Aoun over the appointment of Brig.-Gen. Abbas Ibrahim as the new director-general of the General Security Department. Aoun according to the source told the Patriarch that the matter is in his hand and promised to return this post to the Maronites but the source said he obviously couldn’t. The cabinet on Monday approved the appointment of Ibrahim as the new director-general of the General Security Department and was also promoted to the rank of Major General to qualify for the appointment. The position was most recently held by the late General Wafik Jezzini, a Shiite who passed away last March after suffering from a terminal illness. Jezzini like his predecessor Jamil Al Sayed was very closely associated with Hezbollah . Sayed , who is also a Shiite was one of Syria’s top operatives in Lebanon from 1998-2005, when he was imprisoned in connection with the assassination of former Lebanese premier Rafik Hariri . Ibrahim , like his predecessors is closely associated with Hezbollah. According to Al Manar he played a key role in coordinating army activities with Hezbollah during his previous posts. The position was with the Maronites since 1943 but was taken from them and granted to the Shiites by former president Emile Lahoud in 1998.
that’s why he was saying lets give a chance to this govt and that a govt is better then none…tele3 msadda2 Aoun. Well … that’s the problem with trying to run a ‘business’ (country) on ‘FAITH’ … it doesn’t work. faith is an intergal part of success. I have a suspicion that the Patriarch was following the liar home — 3am yil7a2 el kizzaab 3ala bayto — as the Lebanese saying goes.